PASADENA, Calif. (KABC) -- The Southern California rivalry between UCLA and USC is a deep-seated, decades-old college feud, which evokes strong school spirit and pride from fans on both sides. Here's how fans will cheer their team on to victory in the highly anticipated football game on Saturday. The university's colors were "chosen to represent the state's various attributes: Blue to symbolize the ocean, and local wildflowers. Yellow to reflect the Golden State, the California poppy and sunsets." The "8 Clap" is UCLA's most popular cheer among football fans and is used in the middle of the fight song to raise spirit. How do you join along? Watch the tutorial below. Barbara Lamb and Don Holley wrote the lyrics to the song after being selected as the winners in a contest and Academy Award-winning composer Bill Conti wrote the music to "Mighty Bruins." Conti conducted the UCLA marching band for the song's debut in 1984 at the Stanford football game. USC's official color was gold until it was combined with the College of Liberal Arts' color, cardinal, in 1895. After each touchdown at USC football games, Traveler, a white horse bearing a "Trojan warrior," prances around the arena. A USC dental student, Milo Sweet, composed the music for USC's official fight song, "Fight On," in 1922. It was originally an entry for a Trojan spirit contest. Students, alumni and fans alike hold up an outwards peace sign with their right hand, making a V-shape for "victory." 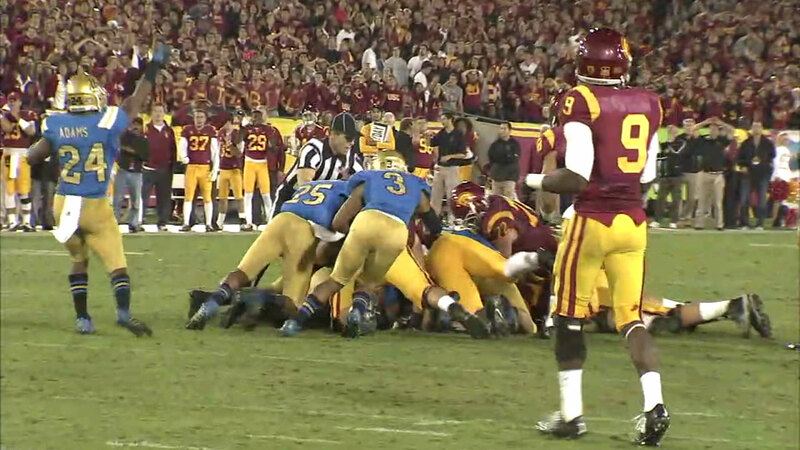 Watch the UCLA Bruins take on the USC Trojans this Saturday on ABC7. Coverage of the game starts at 4:30 p.m.